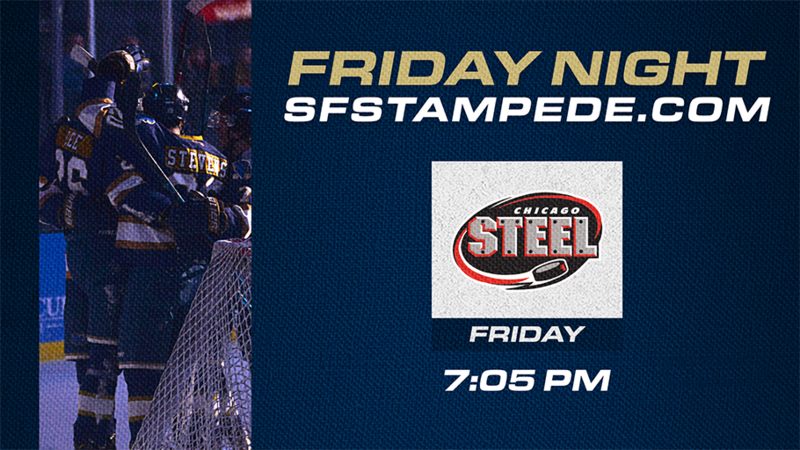 Puck Drop: 7:05 p.m. with doors opening at 6 p.m.
Sioux Falls Stampede host the Chicago Steel at home and are looking for their seventh straight home win at the Denny Sanford PREMIER Center. The Herd is 15-3-1 at the PREMIER Center, including a 5-2 victory over the Lincoln Stars last Friday night. Rookie forward and St. Cloud commit Jami Krannila leads the team in scoring with 13 goals and 19 assists for 32 points. The Steel are also hot, having won 8 of their last 9 games entering Friday and sit in second place in the Eastern Conference at 25-13-1. The Steel are led by forward Nick Abruzzese who has tallied 49 points (16g, 33a) in 39 games this season. Justin Roberts is 18-8-1 in goal with a 3.00 GAA and a .888 save percentage.